He Was Warned, Damn It! As for the Democrats’ claims that Comey’s letter to Congressional committees was unprecedented and contrary to DOJ policy against public discussion of pending criminal investigations, the whole situation with Hillary’s off-the-books email system is unprecedented. Has the FBI ever before carried out a criminal investigation of a presidential nominee in the midst of the campaign? No. Some might cite Special Prosecutor Lawrence Walsh’s October 1992 re-indictment of Caspar Weinberger as a precedent, but that case was entirely different. Walsh was a Democrat. As for DOJ policy, if Loretta Lynch can discuss the FBI’s investigation with Bill Clinton, surely the FBI director can discuss it with Congress. But whom am I kidding? Everyone knows that mere “policies” don’t apply to high-ranking Democrats, let alone the Clintons. More to the point, however, Comey did not, in the first instance, make public comment on a pending investigation. While the investigation was going on, the FBI remained silent. It was when the investigation was over and the decision had been made not to charge Mrs. Clinton that Comey publicly explained, and then was called before a Congressional committee to testify about, his rationale. That action, which was publicly applauded by the Democrats, led directly to Thursday’s communication with Congressional committee chairmen. Comey wrote to tell them that his testimony, under oath, that the Clinton investigation had been concluded was no longer accurate, in view of the newly-discovered emails. 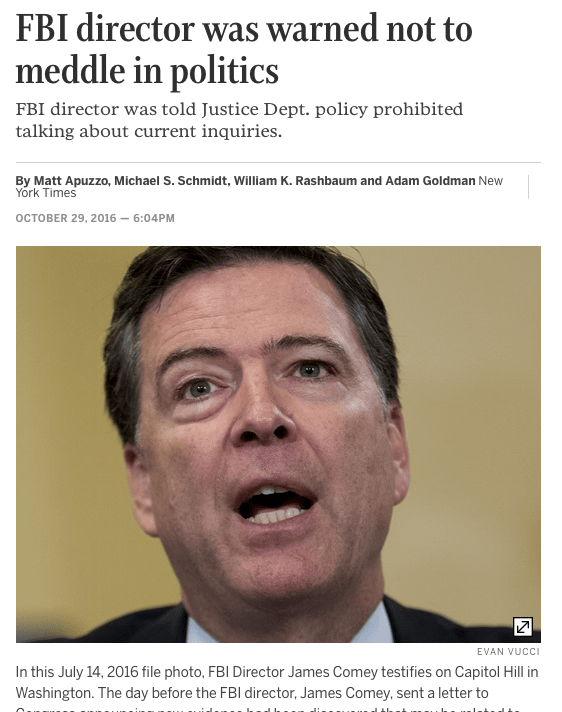 One can agree or disagree with Comey’s course of action, but to denounce it as unprecedented meddling in politics, in violation of DOJ policy, is, in my view, silly.